© Hawi et al. ; Licensee Bentham Open. Arthroscopic debridement represents a salvage procedure for irreparable rotator cuff tears. It is important to accurately diagnose the patient for irreparable rotator cuff tears. The diagnosis and the therapeutic options must be explained to the patient. It is mandatory that the patient understands the primary goal of the arthroscopic debridement being reduction of pain, not improving strength or function. The procedure consists of 7 distinct steps to debride the soft tissues and alleviate pain. Even though there is a lack of evidence that this procedure is superior to other therapeutic options, it has shown good results in patients with the main complaint of pain. The results reported in some studies should, however, be interpreted with caution, taking into consideration the substantial structural damage in irreparable defects. Keywords: Arthroscopy, Debridement, Degenerative rotator cuff tear, Irreparable rotator cuff tear, Massive rotator cuff tear, Rotator cuff, Salvage procedure. Massive rotator cuff tears represent a contemporary surgical challenge. The extent of degenerative rotator cuff tears ranges from partial lesions to complete cuff tears with possible subsequent development of cuff tear arthropathy (CTA). These findings are part of a continuum, and can be at times difficult to distinguish. While most partial tears are repairable, complete tears remain challenging to operate on. Once severe degenerative arthritis develops in setting of a large or massive rotator cuff tear, the term "cuff tear arthropathy" is applied to delineate a disease entity of its own that may require a modified management approach. On the aforementioned continuum, irreparable rotator cuff tears have to be positioned between the still reparable massive rotator cuff tears and the CTA. While diagnosis of CTA is easily made due to its characteristic radiological changes, differentiation between irreparable lesions to reparable once can be quite difficult. An accurate diagnosis is crucial, since sole debridement is considered as a salvage procedure. This should be weighed carefully against other therapeutic alternatives. Clinically, it is often impossible to clearly differentiate these three disease entities, especially given the fact that they represent parts of a continuum. The assessment of the same patient can also differ depending on the surgeon. In theory, arthroscopic debridement may be indicated for all three entities depending on the surgeon´s interpretation. The definition of massive rotator cuff tears varies in the literature. It can either be made by anatomic structures, or by remaining functionality . According to Cofield et al. , a tear with an antero-posterior diameter of 5 cm or more is considered a massive tear. Zumstein et al. defined a complete tear of two or more tendons as a massive tear. A massive rotator cuff tear is considered as at least partially reparable and has to be differentiated from the irreparable tear . Bedi et al. quote that the irreparable lesion is defined as the presence of a massive rotator cuff tear with 1) a static cranial migration of the humeral head, 2) a reduction of the acromiohumeral space and 3) atrophy and fatty infiltration of more than 50% of the corresponding muscle tissue, with possible concomitant arthritic changes . Neer et al. defined cuff tear arthropathy (CTA) as insufficiency of the rotator cuff with a cranial migration of the humeral head and osteoarthritis of the glenohumeral joint. Looking at an irreparable defect, one has to acknowledge that all potential therapies are “salvage procedures”, and that a complete restoration of the shoulder function is illusionary. Prior to proceeding with this palliative approach, other possible therapeutic approaches should be excluded. These alternatives would aim to at least partially restore shoulder function, and include partial rotator cuff repair, patch-augmented rotator cuff repair, tendon transfer, implantation of subacromial spacers, or the implantation of a reverse total shoulder arthroplasty. Conservative management remains a viable alternative and should be considered at all stages (Fig. 1). It can be oftentimes challenging to find the ideal therapeutic approach for a given patient . 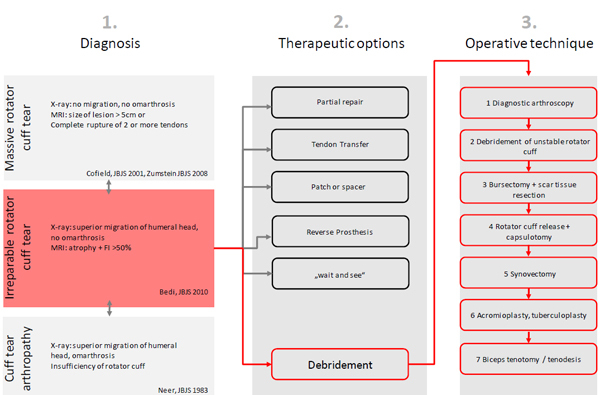 Algorithm for irreparable rotator cuff tears with 1) a checklist for exact determination of the preoperative diagnosis, 2) different therapeutic strategies, and 3) a systematic flowchart of the surgical technique. It is helpful to consider the patient’s compliance and level of activity when choosing the right therapy. The patient’s medical comorbidities including his smoking status should also be included in the decision making process. A detailed discussion with the patient about the expectations of outcome should be conducted. The heterogeneity of the patients population on the one hand, and missing clinical data in the literature on the other hand, are resulting in a lack of clinical guidelines for the management of this patient group . The purely debriding intervention is quoted in some of the literature as “limited goals surgery” and should be clearly communicated and explained to the patients. Looking at it as such, this type of therapy shouldn't be considered for patients with high expectations in terms of functionality and is to be considered more as a therapy with its main goal in pain reduction . It is paramount to communicate to the patient that the therapeutic goal of pure debridement is to improve mobility and pain. An increase of strength of the shoulder joint is not to be expected. We find that the ideal patient to consider for sole debridement would be one that 1) presents with an irreparable defect due its lesion size, 2) has a lack of arthrosis, 3) is not suitable for a tendon transfer, and 4) suffers from significant pain that is recalcitrant to conservative management. Also the patient’s age has to be taken into consideration. Ideally, the patient should be able to keep his arm in a horizontal position by himself, which states a well functioning deltoid muscle and an intact coracoacromial arch . Bedi et al. suggested debriding procedures to be indicated in patients at advanced age, with a low activity level, a good remaining mobility, with the main symptom of severe pain. In addition to that, Verhelst et al. included the failure of nonsurgical therapies. The preoperative clinical examination and imaging (conventional radiographs and Magnetic Resonance Imaging) of the patient make it possible to at least anticipate an irreparable rotator cuff tear (Fig. 1). This is of particular importance to enable the surgeon to discuss the debriding intervention with the patient in advance. The final decision about the feasibility of a rotator cuff repair (versus debridement) can only be made intraoperatively. Ideally, the operation should be planned and discussed as debridement with the patient prior to surgery. In a less ideal setup, the decision has to be taken intraoperatively, after a repair was anticipated and could not be performed. According to the current literature, the purely debriding intervention cannot really be advised, due to the lack of evidence-based studies . However, the advantages of sole debridement contain the short operation time, an accelerated postoperative care and a lower rate of complications when compared to the aforementioned therapeutic options . According to Boileau, patients with pseudoparalysis do not benefit from the debriding approach . Neri et al. pointed out that patients, in spite of having an irreparable tear, should have stable glenohumeral joint kinematics when planned for sole debridement. Burkhart et al. introduced the so called “force couples” concept . This concept applies to the transversal plane (couple: subscapularis and infraspinatus tendon) as well as the coronal plane (couple: deltoid muscle and the inferior parts of the rotator cuff). With intact force couples, the humeral head is centralized in the joint socket, and stable glenohumeral joint kinematics are maintained . Gartsman et al. found that irreparable tears of the subscapularis or infraspinatus tendon with concomitant migration of humeral head were predictive for poor outcomes after sole debridement procedures. This was thought to be due to an imbalance of the “force couples”. The main target of the intervention is to identify and eliminate all possible sources of pain . The surgery is performed usually as an arthroscopic procedure and consists of working through a list of up to 7 points. Depending on the surgeons preference, the intervention varies in complexity. Initially, a diagnostic shoulder arthroscopy should be performed to confirm the indication for sole debridement. In cases where the intraoperative findings suggest that a repair may only be questionably successful, a complicated repair may be hard to justify in some patients regarding the mainly positive clinical results after debridement . Burkhart et al. postulated that the debridement of unstable remnants of the rotator cuff and of the thickened bursa reduced the mechanical irritation and subsequently inflammation. After identification of the rotator cuff and removal of its unstable remnants, the entire subacromial bursa and its scar tissue are being removed . The synovia is then partially removed at areas of hypertrophy and inflammation. Reider discussed 2010 the additional benefit in terms of pain relief if an extensive release of the retracted rotator cuff is being performed [12, 14, 15]. The value of performing acromioplasty is controversial in the literature, mainly due to the impact on the coracoacromial arch [10, 16]. To prevent superior migration of the humeral head with a manifest rotator cuff defect, the use of acromioplasty has been decreasing in such cases . As an alternative to acromioplasty, tuberculoplasty might be performed. Fenlin et al. followed the concept of an open tuberculoplasty for irreparable tears to restore the acromiohumeral articulation. Scheibel et al. reported a similar arthroscopic technique with a “reversed” subacromial decompression (SAD) with trimming of the greater tuberosity. Verhelst et al. recommended a release of the rotator cuff and a paralabral capsulotomy. They also intentionally omitted acromioplasty and performed reversed subacromial decompression as described by Fenlin instead. The long head of the biceps tendon can be another significant pain generator. Liem et al. recommended a biceps tenotomy for all patients undergoing debridement, reporting significant functional improvement without loss of biceps strength. Boileau et al. performed either arthroscopic biceps tenotomy or arthroscopic biceps tenodesis on all patients with irreparable rotator cuff tears associated with a biceps lesion depending on the intraoperative findings. They found that both tenotomy and tenodesis effectively reduced pain and dysfunction, with however no differences between the tenotomy and the tenodesis group. Their patients showed an improvement in the Constant score from 43.3 preoperatively to 66.5 points after debridement. Teres minor atrophy, true preoperative pseudoparalysis and severe cuff tear arthropathy were predictive for worse postoperative results. However, Klinger et al. found no significant benefit for debridement with biceps tenotomy compared to sole debridement in their patient cohort . The postoperative functional therapy starts after 48 hours of rest, with assisted and stretching exercises, as well as isometric exercises for the deltoid muscle. Rockwood et al. reported a 83% pain reduction rate in their patients with irreparable rotator cuff tears treated with sole debridement. The average mobility improved from 105 degrees of active anteversion preoperatively to 140 degrees postoperatively. Klinger et al. reported an improvement of the Constant scores from 40 points preoperatively to 68 points postoperatively in their patients. Gartsman  reported an improvement of the average Constant scores from 31 points preoperatively to 52 points postoperatively with maintenance of a positive effect after one year after open debridement of irreparable tears. Fenlin et al. showed a marked improvement of the shoulder function and UCLA-Score from 9.3 preoperatively to 27.7 points postoperatively after tuberculoplasty. Verhelst et al. found an improvement of the Constant score from 34.9 to 84.0 points. Scheibel et al. reported a significant improvement of the Constant score from 66 preoperatively to 91 points postoperatively after applying the reversed SAD method. Despite the generally good clinical results, significant narrowing of the acromiohumeral distance and a progression of radiologic osteoarthritis after surgery have been described [10, 16]. With these data in mind, we suggest the clinician go through an algorithm, where initially the accurate diagnosis has to be established (Massive rotator cuff tear vs. irreparable defect vs. CTA). A thorough discussion with the patient has to follow laying out all possible therapeutic options. The spectrum of these alternatives initially appears to be very wide, but they get filtered out pretty quickly by the “Factor Patient”. When planned well, it is quite rare that an intraoperative switch from a planned repair to a pure debridement has to be made. Surgery is performed systematically with the arthroscopic approach working through a list of 7 steps (Fig. 1). Patients with an irreparable defect of the rotator cuff pose a challenge for the treating orthopedic surgeon. The main difficulty consists in preoperatively establishing the criteria for the irreparable defects of the rotator cuff. After that, all alternatives including debriding procedures have to be evaluated with the patient. Patients with pain as the main symptom and relatively well maintained mobility seem to be good candidates for this procedure. The sole debridement intervention is being performed arthroscopically and consists mainly of debridement of soft tissue with the aim of pain reduction. The coracoacromial arch should be preserved under all circumstances. If acromioplasty is being performed, this should be done in a conservative manner. The concept of a tuberculoplasty can be contemplated as an alternative. Retrospective studies show satisfactory results, at least at mid-term. Each author certifies that he has no commercial associations (e.g, consultancies, stock ownership, equity interest, patent/licensing arrangements, etc) that might pose a conflict of interest in connection with the submitted article. Cofield RH, Parvizi J, Hoffmeyer PJ, Lanzer WL, Ilstrup DM, Rowland CM. Surgical repair of chronic rotator cuff tears. A prospective long-term study. J Bone Joint Surg Am 2001; 83-A(1): 71-7. Kim SJ, Lee IS, Kim SH, Lee WY, Chun YM. Arthroscopic partial repair of irreparable large to massive rotator cuff tears. Arthroscopy 2012; 28(6): 761-8. Neri BR, Chan KW, Kwon YW, et al. Management of massive and irreparable rotator cuff tears. J Shoulder Elbow Surg 2009; 18(5): 808-18. Verhelst L, Vandekerckhove PJ, Sergeant G, Liekens K, Van Hoonacker P, Berghs B. Reversed arthroscopic subacromial decompression for symptomatic irreparable rotator cuff tears: mid-term follow-up results in 34 shoulders. J Shoulder Elbow Surg 2010; 19(4): 601-8. Liem D, Lengers N, Dedy N, Poetzl W, Steinbeck J, Marquardt B. Arthroscopic debridement of massive irreparable rotator cuff tears. Arthroscopy 2008; 24(7): 743-8. Boileau P, Baqué F, Valerio L, Ahrens P, Chuinard C, Trojani C. Isolated arthroscopic biceps tenotomy or tenodesis improves symptoms in patients with massive irreparable rotator cuff tears. J Bone Joint Surg Am 2007; 89(4): 747-57. Jost B, Zumstein M, Pfirrmann CW, Gerber C. Long-term outcome after structural failure of rotator cuff repairs. J Bone Joint Surg Am 2006; 88(3): 472-9. Burkhart SS. Reconciling the paradox of rotator cuff repair versus debridement: a unified biomechanical rationale for the treatment of rotator cuff tears. Arthroscopy 1994; 10(1): 4-19. Reider B. Success or failure? Am J Sports Med 2010; 38(1): 23-4. Scheibel M, Lichtenberg S, Habermeyer P. Reversed arthroscopic subacromial decompression for massive rotator cuff tears. J Shoulder Elbow Surg 2004; 13(3): 272-8. Fenlin JM Jr, Chase JM, Rushton SA, Frieman BG. Tuberoplasty: creation of an acromiohumeral articulation-a treatment option for massive, irreparable rotator cuff tears. J Shoulder Elbow Surg 2002; 11(2): 136-42. Klinger HM, Spahn G, Baums MH, Steckel H. Arthroscopic debridement of irreparable massive rotator cuff tears--a comparison of debridement alone and combined procedure with biceps tenotomy. Acta Chir Belg 2005; 105(3): 297-301.